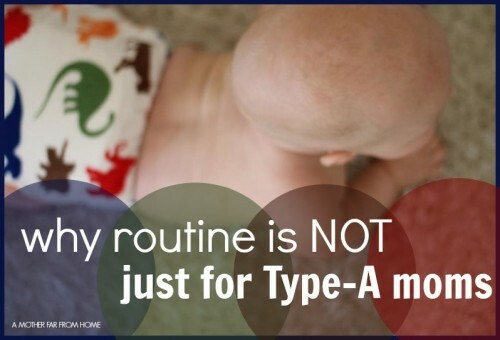 I often hear people say that only structured Type-A moms have good routines at home. It’s usually not said in judgment, but stated as a fact. As though mothers who are naturally more relaxed and easy going couldn’t cope with a routine or do it well. I think it’s a myth that’s been perpetuated long enough! What do I mean by routine? Tsh from The Art of Simple wrote a post a while ago called Routine Isn’t a Dirty Word. You don’t have to create a set of rigid actions you must do before 9 a.m. and line everyone up assembly style to make them happen. Routine can simply be patterns, rhythms, and good habits that already exist during your day. Even the most laid back mom will have certain things she likes done at certain times throughout the day. And that’s okay. In fact, it’s great! It is often these habits that help us go on auto-pilot when we need to save our brainpower. The benefits of routine are widely documented and accepted. In fact, many successful businessmen and entrepreneurs will go so far as to say that eating the same exact thing every morning for breakfast is part of their routine. Why? They want to save all their decision-making bandwidth for more important daily tasks. One of the most important reasons your family needs a routine is so sleep patterns and habits can be developed. Children who are tired are more irritable, less able to concentrate, and more emotionally “all over the place.” Establishing pre-naptime habits will help children go naturally to nap. Establishing bedtime routines will increase cooperation at bedtime. The goal is not to work against your kids, but to find a rhythm that helps meet everyone’s needs. 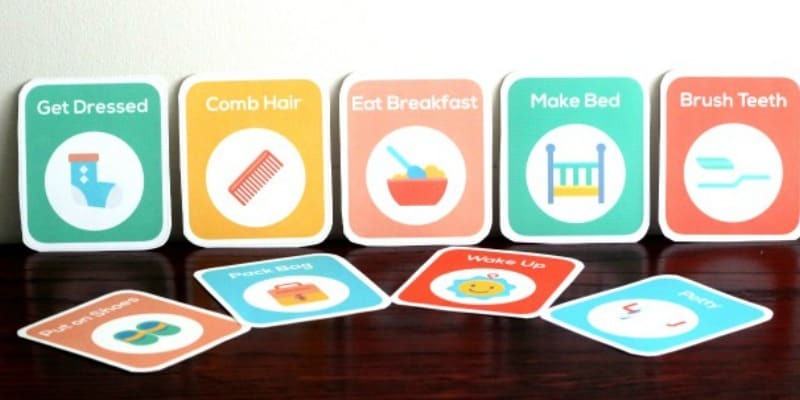 Printable routine cards for morning, evening, bedtime routines and more. Type A or B? And who cares, anyway? I’m going to admit it. In fact, there’s no denying it. I’m Type A. It is what it is and that’s how the cookie crumbles over here. One of my posts said something to the effect of “Type A moms love routine, schedules, and putting into place good sleep habits” and then I got an email from a reader. One that oh-so-lovingly told me that Type A’s don’t have the monopoly on routines and rhythms. It was such a great email I asked her if I could share it. In the United States, there’s this persistent idea that sleep training, and scheduling is a real “Type A Mom” kind of thing. The moms that need to be in charge force their poor offspring to comply with a schedule that suits them (the moms, of course) best. This used to puzzle me. I am FAR from a type A person – ask anyone that knows me. Then why did I naturally gravitate towards a schedule when I had my first baby? The other day, I checked a book out of the library titled “Sleepless in America*” (Mary Sheedy Kurcinka) and it helped me to understand. You see, I was born in the Netherlands. And this book is sprinkled with facts the Dutch believe about sleep. “In Holland, only 9% of babies are considered “fussy”. In the United States, that number is 19%. The difference, many believe, is in the routine. Dutch families begin a routine from day one. It lowers stress hormones for the mom, and, as a result, for the babies as well.” (p 258). “While conducting her study with Dutch families, Sara Harkness from the University of Connecticut told me: “Watching the infants, I noticed that when they began to fuss I assumed they were bored and would have offered something to stimulate them. The Dutch parents, however, interpreted it as fatigue and put them to bed. The babies slept. Dutch toddlers sleep an average of two hours a day more than children in the United States.” (p 239). My mom (also not type A) had all of us on a routine from birth. No strict and rigid schedule straight from a book – just a common sense routine that, well, made sense. She just went with the rule her own mother had taught her about babies – Rust, Reinheid, Regelmaat. (Peace, Cleanliness, Rhythm/routine). It just seemed to make perfect sense – babies need peace, they need an uncluttered and clean environment, and they need a routine just like adults do. What if someone decided for you that tonight you’re not sleeping from 11 pm-7 am but rather from 3 am-11 am? How would you feel? Exactly… it makes sense, doesn’t it? I don’t think we had ever even questioned this, or the fact that all children under 10 are in bed by 7:30 pm, and that no little children are ever out at night…. all those things were just normal life for us until we moved to the USA. My mom was shocked to the point of indignant to see toddlers still up and in Walmart at 10 pm… babies in church when they should be napping… or little children napping on the go. So often, opponents of [insert sleep training method] will say things about “other cultures” where people don’t sleep train at all and children are never fussy. Um? After a couple years in the US, I moved to Africa. I was involved in mission work in a remote village in West Africa. The point I want to make is that you can NOT compare our American lives with those in a third world country. True, they don’t “go by the clock” and they don’t sleep train. But life is ever so much more child friendly and they most certainly DO have a routine going. In the village where I lived (close to the equator) it always got light at 6 am and dark at 6 pm. There was no electricity, so after dark, it just was natural for kids to go to sleep. There are no bright lights, electric toys or TVs to overstimulate a baby. Their life was a lovely rhythm of taking a nap under a tree in the farm, then snoozing on their mom’s back wrapped in a cloth, and a long, calm and quiet night. You just cannot compare our lives of endless errands, obligations, gadgets, and happenings with that sort of life. So, we are going to have to do some purposeful things to make sure our babies get their rest. My favorite point Elisabeth made was that in other countries and in the past, life was slower and more conducive to an everyday routine that rarely changed. Children and parents benefitted from this routine naturally. In our society today everything and everyone is so busy that you have to be purposeful to have a good routine. Being purposeful can seem to those decidedly Type B that you’re “forcing” something. But that’s because you are. And that’s because you have to or it just won’t happen. 20+ routines just for you! 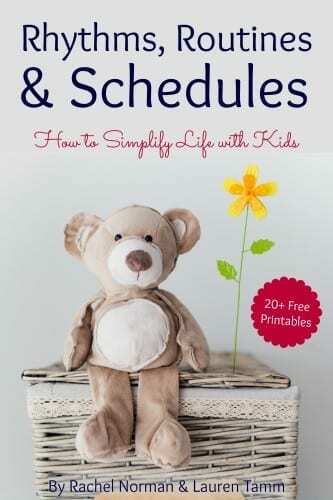 We’ve written a book CHOCK FULL of routines for babies ages 6 weeks to 5 years. It includes tons of tips for managing the day as well as over 20 printables! Click here to learn more. I am a relaxed Type A…I mostly love routine but I am not afraid to deviate! I totally agree that the fewer decisions you need to make in a day, the better! I didn’t try to get my baby onto a routine until he was about five months old…I obviously wanted him to nap during the day and to sleep at night and so we fell into some patterns but it wasn’t anything premeditated. I think part of that is the luxury of having a year of maternity leave…I didn’t feel any real pressure to convert to very set routine and instead I suppose I used common sense and let it happen on its own? Perhaps I just live a very slow life? This is such great information. I love it.